Sometime next year, this silent, clean, solar-powered, catamaran-style vessel named PlanetSolar will circumnavigate the Earth. 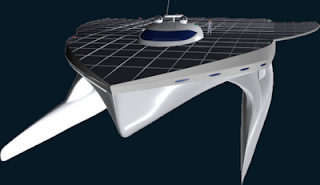 At 31-meters in length, PlanetSolar is promised to be the biggest solar ship in the world. It will be covered with 470-square-meters of photovoltaic panels capable of generating as much as 103.4 kilowatts of power. Operated by two sailors, the multi-hull ship will be able to carry as many as 50 passengers at about ten knots, average speed.